Life of a Twingle Gal: Tag, You're It! I was tagged a couple of days ago by LeeAnn at The Life of Rylie...& Bryce Too! She's tagged me to play along in a cute spinoff of a childhood game. LeeAnn had to answer 8 questions on her blog and she has tagged 8 bloggers to answer 8 of her questions; I'm one of those bloggers! I'll answer LeeAnn's questions then tag 8 more bloggers to answer 8 of my questions. 1. What was your favourite class in high school? Do I only have to pick one? I loved school, or at least the educational aspect of it. I hated the politics and cliques that went along with it. Nevertheless, I think I have two subjects that would be considered favourites. The first is Music. I was in the band playing clarinet. 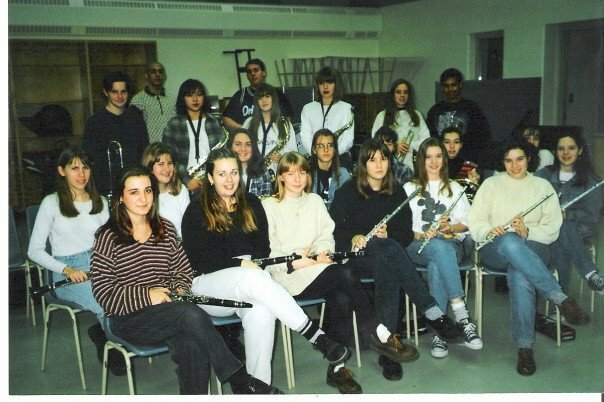 Music class was a chance to improve my skills, make friends and release the stress and tension brought on by trying to fit in to above cliques. My other favourite was French. I LOVE languages. I am very lucky that they come easily for me. In Ontario, at the time, students started core French in grade 4 and continued until grade 9. After which, it was no longer mandatory. I continued with it after grade 9, completing two OAC's and then majoring in French Lit in university. I'm second from the left in the front, not sure what's up with the look on my face! Wow, this one was harder than I thought it would be. Narrowing it down to only 1 show? Really? Sigh. I guess I'm going to have to say Grey's Anatomy. Which I find very ironic considering I only started watching it one season ago. I was pregnant with Pickleand there was nothing on tv one night, so I ended up watching the second to last episode of season 5. I sobbed my way through the episode and knew right away I had been missing a great show. I went to the library and proceeded to borrow seasons 1-5 to get caught up. I think I managed to watch 4 seasons in a week...that's A LOT of tv! 3. Do you have any weird habits? If so, what? I don't know that I have any weird habits; but, I do have things I like done a certain way. I guess I have a touch of OCD. Take for example fajitas. I have to assemble my fajita exactly the same way every time or I can't eat it. 4. Do you wake up easily in the morning, or require coffee, exercise or something else to get you going? I'm actually a morning person, so I wake very easily. The alarm goes off and up I pop. There are some mornings when I drag a little; but, 90% of the time I'm ready to go. The downside to being a morning person though is that I can barely stay up past 10pm. Most nights I'm in bed by 9-9:30; and on nights where Mr. Twingle and I go out with friends, I'm usually good until I get in the car to head home and then I crash. Thankfully Mr. Twingle drives most of the time, so it doesn't become a safety issue. 5. What kind of qualities make a good friend? I think a good friend is someone that is compassionate and understanding. Someone that you don't necessarily need to talk to every day or every week; but, would still be there when you need them no matter how much time had passed. 6. What is an experience you've had where you couldn't stop laughing? Oh my, do I really have to narrow it down? I love to laugh (wasn't that a song in Mary Poppins?) and laugh often. It actually makes Mr. Twingle crazy that I can get a good laugh going over nothing in particular. Of course his displeasure in my fits of laughter usually make me laugh harder, so he really can't win, LOL! 7. Have you ever met an internet friend in real life? Yes, I've met several. All of whom have been wonderful and I'm glad to have met them. I was a carrier for a local paper, the Penny Saver. 2. Do you believe in life on other planets? 3. What is your favourite childhood television programme? 4. What do you think of right before you fall asleep at night? 6. What is one thing you like about being an adult? 7. Would you rather have a million dollars or true love? 8. How do you behave during a crisis? Hopefully, these are too hard and my tagged bloggers will have fun! Let me know when you answer so I don't miss your posts! I really like Grey's Anatomy too! And I have done the same thing as you where I caught an episode of a show and then had to go back and watch all of the past seasons. We did that with Two and a Half Men. I wish I could wake up easily in the morning. But then maybe I shouldn't stay up so late. I, too, crash if I'm not doing anything. I usually can't watch TV at night because I fall asleep. Those are some great questions you posed for your 8 bloggers. I'm going to have to check their sites to see when they answer.